- a remodeled Grand Hall, east & west restrooms, kids' play area. - a new family restroom replaced the former East business center. - A 2-way passage between Concourses A B are maintained in front of the Police Office. - The Grand Hall got a high-ceiling. - Table & chair configurations in the open areas were adjusted to maximize seating. - Queue lines were installed to identify facilities. - Concourse entrances & TSA screening operations were maintained. - The 'Prospect Hill Brewhouse' opened at post-security, along with 2 Starbucks (at pre- & post-security), and a new retaurant in each of Concourses A & B. Retail space in the new Gateway aea includes 'Touch of Grand Rapids store', a travel magazine stores in each concourse, and a Hudson News store at the Grand Hall. Level 1 is divided into the Arrivals Hall in the center, with check-in facilities on each sides: At East are check-in facilities for American & Delta & airlines - at west are check-in facilities for Allegiant, Southwest & United airlines. From both the Game Room and the Food Court passengers may access Level 2* via elevator or stairs. Amenities & services on Level 1 include an ATM, mail drop, Information desk, baggage carts & Baggage Claims 1, 2 & 3. The Grand Hall area has a business center,, gift shop, Kids Port, International Room, a game room & food court , and connects, via separate security check, to the A & B Concourses and to Level 2. Both concourses offer ATM, news & gifts, & family restrooms. *Level 2 of the passenger terminal houses offices of the TSA & Dept. of Aeronautics, a Food Court, an Observation Deck, and the following meeting rooms available for rent: Gerald R. Ford Room, Grand Rapids Room, Golden Eagle Room, Kent Room & Michigan Room. Concourse A with gates A1-A7 is presently served by Delta and American airlines (Delta's help center next to the men's restroom). 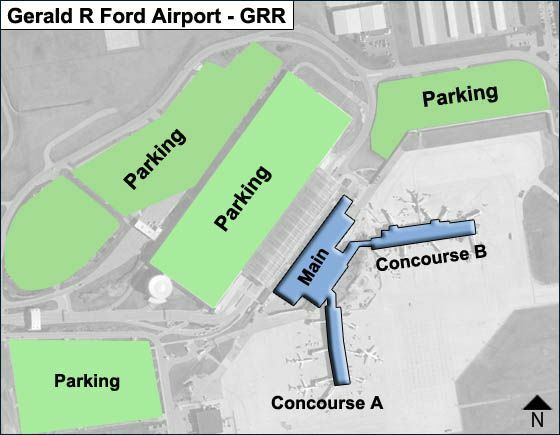 Concourse B with gates B1-B8 is presently served by Allegiant, Southwest & United airlines. It houses a food court, news/gifts. Note that Allegiant Air closes its ticket counter 40 minutes prior to scheduled departures; no Allegiant boarding thereafter is permitted.